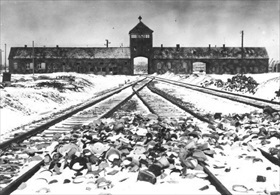 On this date in 1944 in Poland, the last murders by poison gas took place at the Nazis’ largest and argu­ably most in­famous death camp, Auschwitz-Birkenau (Polish, Oświęcim), one of eight camps used for mass murder during World War II. (Six were in what is today’s Poland, one in Belarus, and one in Croatia, the latter operated by fascist Ustaše forces; see map below.) Estab­lished in 1940 under Ger­many’s Minis­ter of the Interior Hein­rich Himm­ler and expanded by camp com­man­dant SS-Ober­sturm­bann­fuehrer (Lt. Col.) Rudolf Hoess (Höss), Au­schwitz-Bir­ke­nau was the site where an esti­mated 1.1 mil­lion people, around 90 per­cent of them Jews, were killed in gas cham­bers (located at Bir­ke­nau) or by clubs and hatchets, shootings, hang­ings (usually during roll-call), dis­ease (both natural [e.g., typhus] and medi­cally in­flicted), phy­sical ex­haus­tion, mal­nu­tri­tion, and star­va­tion. After Adolf Hitler had ordered the phys­i­cal exter­mi­nation of Europe’s Jews, Himm­ler selected Hoess’s camp for this pur­pose owing to its easy access by rail, its proxi­mity to mineral resources, and its rela­tive iso­la­tion. Orig­i­nally Au­schwitz housed Soviet POWs, but it also pro­cessed those rounded up under Nacht und Nebel, the Nazis’ “dis­appear­ance” cam­paign. Pri­soners whose files were marked “return not desired” or “do not transfer” were killed. Camp labor, esti­mated at over 400,000, was used ex­ten­sively in quarries, ponds dredging mud and clearing rushes, and on-site fac­tories estab­lished by Sie­mens, Krupp (muni­tions), and I.G. Far­ben (syn­the­tic rubber). During his super­in­ten­dency, Hoess tested and per­fected the tech­niques of mass killing that made Au­schwitz the most po­tent sym­bol of the Holo­caust and cer­tainly the most effi­ciently mur­derous in­stru­ment of the “Final Solu­tion.” During one 24‑hour period, Hoess cal­cu­lated he had exter­mi­nated 10,000 peo­ple. When the camp was lib­er­ated by the Soviets on Janu­ary 27, 1945, only about 7,600 pri­soners were pre­sent, while roughly 50,000 had been hast­i­ly evac­u­ated by the Nazis, many of whom died on the forced march. Hoess, cap­tured by Brit­ish troops in 1946, was turned over to the Poles, who, after his trial in Warsaw, hanged him adja­cent to a cre­ma­torium at Au­schwitz on April 16, 1947. Hoess had just he finished writing his chilling memoir, Death Dealer. Above: Routes to the major death (extermi­na­tion) camps (signi­fied by hard-to-see skull and cross­bones in black box) in Ger­many, Poland, Bela­rus, and Croa­tia. The esti­mated total num­ber of people killed in the camps is over three million: Auschwitz-Birkenau (Poland), 1,100,000; Bełżec (Poland), 600,000; Chełmno (Poland), 320,000; Majdanek (Poland), 360,000; Sobibór (Poland), 250,000; Treblinka (Poland), 700,000–800,000; Maly Trostenets (Belarus), 65,000; and Jasenovac (Croatia), 85,000–600,000. 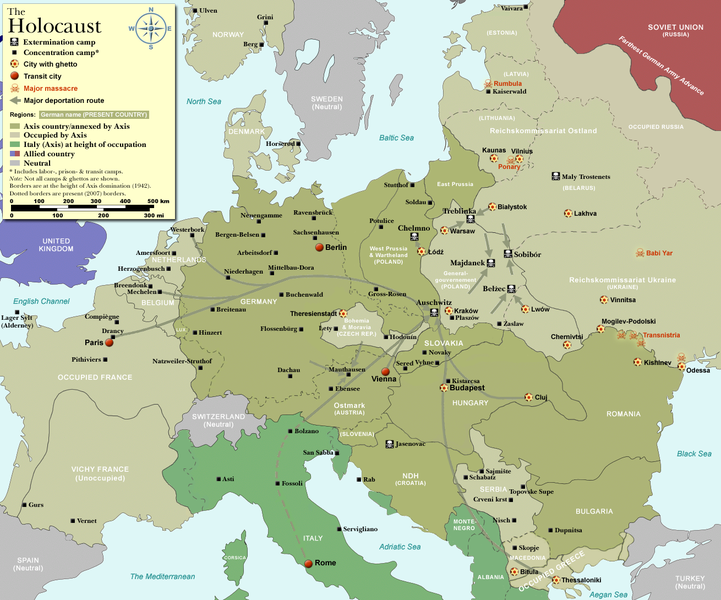 Right: Beginning on January 27, 1945, almost 9,000 pri­soners in Au­schwitz I (the Stamm­lager, or main camp), Au­schwitz II-Birke­nau (the exter­mi­na­tion camp), and Mono­witz-Buna (Mono­wice, or Auschwitz III), judged unfit to join the SS forced evacu­a­tion march, were liber­ated by Soviet troops, a day com­memo­rated around the world as Inter­na­tional Holo­caust Remem­brance Day. Over 230 Soviet soldiers died while liber­ating the camps, sub­camps, and the near­by city of Oświęcim. In 1947, Poland founded a muse­um on the site of Au­schwitz I and II. 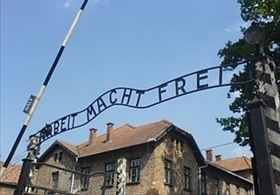 Millions of visi­tors (1.4 mil­lion in 2012) have passed through the iron en­trance gates to Au­schwitz crowned with the noto­rious motto, ARBEIT MACHT FREI (“Work Sets You Free”). 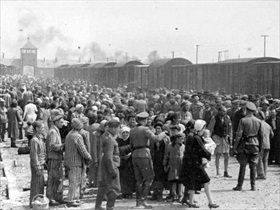 Left: Hungarian Jews on the Judenrampe (Jewish ramp) after dis­em­barking from trans­port trains. Being directed rechts! (to the right) meant camp labor. Sent links! (to the left) meant the gas chambers at Birkenau. 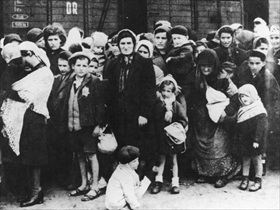 Right: Hungarian Jewish mothers, children, elderly, and infirm sent links (to the left) after “selec­tion,” May 1944. 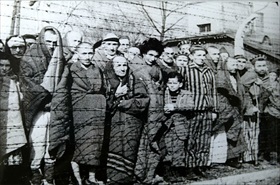 They would be mur­dered in gas chambers soon thereafter. Left: Survivors at the camp liberated by the Red Army in Janu­ary 1945. Army medics and order­lies gave the first orga­nized help to sur­vi­vors. Two Soviet field hospi­tals soon arrived and began caring for more than 4,500 ex-prisoners from more than 20 coun­tries, most of them Jews. Numer­ous Polish volun­teers from Oświęcim and the vici­nity, as well as other parts of the coun­try, also arrived to help. Most of the volun­teers belonged to the Polish Red Cross. Liber­ated pri­soners who were in rela­tively good phy­sical con­di­tion left Au­schwitz imme­di­ately. Most of the patients in the hos­pital did the same within three to four months. 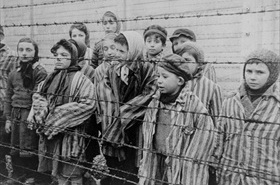 Left: Child survivors of Auschwitz, wearing adult-size pri­soner jack­ets, stand behind a barbed wire fence on the day of their liber­a­tion by the Red Army. The majo­rity of the liber­ated child pri­soners left Auschwitz in sepa­rate groups in Febru­ary and March 1945, with most of them going to char­i­table insti­tu­tions or children’s homes. Only a few were ever reunited with their parents.